Like a well-engineered tower of brightly colored building blocks, the Lego movie franchise, now four films strong, achieved its zenith with “The Lego Batman Movie,” a 2017 stand-alone spinoff of the excellent 2014 original that appealed to both young fans of the construction toys and grown-up aficionados of the brooding Caped Crusader. Funny, smart and unexpectedly moving, it was a story that could be enjoyed on multiple levels simultaneously. Later that same year, the wobbly, less inspired “The Lego Ninjago Movie” hit theaters, more like a feature-length commercial for the titular TV show and its tie-in construction sets than a necessary addition to the canon. The new “The Lego Movie 2: The Second Part,” while cute, enormously entertaining and stuffed with more jokes than you can count, is only a half-step up. Partly, that’s a problem that’s built into its very premise. Picking up where the first film left off, with the Lego-size city of Bricksburg being threatened by invading aliens from a world of Duplo building blocks – Lego’s toddler-centric gateway drug for ages 1½ to 5 years old – “The Second Part,” like the first, plays out as one giant metaphor: It’s a story taking place in the imagination of a child, Finn (Jadon Sand). Here, however, Finn’s antagonist is no longer his father (Will Ferrell), a man whose obsessive-compulsive engagement with Legos flew in the face of Finn’s more freewheeling sense of play, but his little sister, Bianca (Brooklynn Prince). Finn, now five years older and a teenager, has adopted a darker, more grown up sensibility. His Lego world is post-apocalyptic, evoking the “Mad Max” universe at times (along with “The Matrix” and other R-rated entertainments that he has, presumably, been digesting in the interim). Bianca’s imaginative universe, with which his clashes in this tale, is more, er, princess-pink. 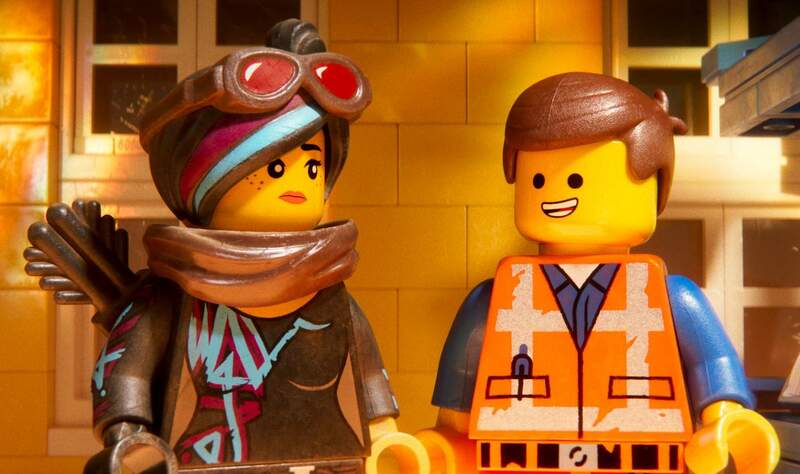 Although both this film and the 2014 original center on a conflict between styles of play, “Lego 2’s” central struggle – between what’s dark, cool, edgy and grown up and what is cute, shiny, poppy and young, as a line in the film puts it – carries over to our enjoyment of the film itself. In other words, Finn and Bianca’s failure to play well together infects the experience of watching it. Because their make-believe worlds can’t resolve their differences – threatening to lead to something called “Our-Mom-ageddon,” in which Finn and Bianca’s mother (Maya Rudolph) will relegate their toys to storage bins – there’s a persistent schism in “Lego 2” itself. In the story, that split manifests itself in numerous ways: Bianca’s main plaything, the self-absorbed queen of the Systar system, Watevra Wa’Nabi (voice of Tiffany Haddish), has kidnapped several characters from Bricksburg, including Batman (Will Arnett), whom she plans to brainwash and marry in an elaborate ceremony. (Think of it as the Lego version of a little girl’s tea party, but with her big brother’s military action figures.) Chris Pratt’s naive Emmet Brickowski, aided by the superhero Rex Dangervest, must rescue his friends, including his ladylove Lucy (Elizabeth Banks). In a clever touch, Rex – whose last name evokes Pratt’s costume in “Jurassic World” – is also voiced by Pratt. But as this rift between on-screen worlds persists, so does it in the seats. To be sure, there is much that is knowing and snarky in this most meta of movies. Rex carries a CPD – a Convenient Plot Device – and a weapon called an Implausitron. And the jokes about various performers of the Batman character – from Ben Affleck to Adam West, and everyone in between – fly like Lego bricks being hurled at each other by warring siblings. But the film’s underlying conceit, one that continually toggles back and forth between the worlds of Emmet/Watevra Wa’Nabi and Finn/Bianca, is handled less gracefully than it was in the first film. “The Lego Movie 2: The Second Part” is at times enormously fun, especially during a six-minute closing-credit sequence accompanied by a rap featuring the singer Beck and the Lonely Island comedy trio. But like a forced marriage between a Lego minifig and a Duplo character, its parts don’t fit together seamlessly.